The game was invented by Maureen Hiron in 1996. She is a very successful game inventor and know for inventing several other games including: 7 Ate 9, Continuo and Qwitch. The word Cambio means exchange. Like we say in the video we like this game, the design of our specific issue of it could be better but apart from that its a fun and fairly simple strategy game thats not too long to play but not so fast you miss what just happened. The game was invented in 1991 by Swiss mathematician Blaise Müller. 1993 Spiel des Jahres Recommendation. 1985 Concours International de Créateurs de Jeux de Société Winner. Like we say in the video, we like this game a lot! My only issue with it is retaining enough concentration to keep in check all of the eight different piece attributes that could create a line. However I would highly recommend this game and if you like games that range from Connect Four to Chess then you will most probably love this game. Publishers: Cheatwell Games and Drumond Park Ltd. 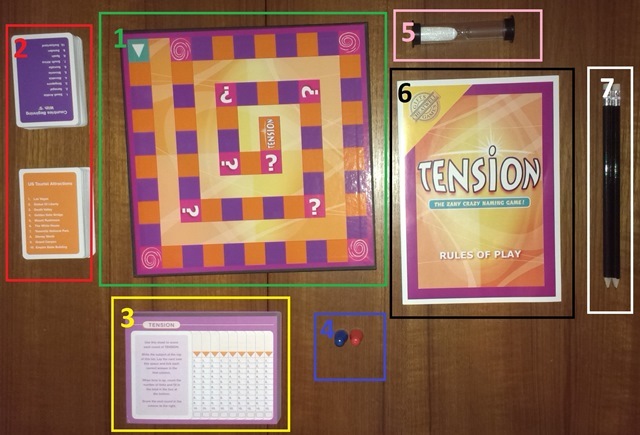 Tension is an interesting game, in the sense that it says; “NO! Not all answers to this question are right… Only the ones that I randomly preordain as right will score you points”. So. You end up getting angry at it because you name every James Bond film except for the ones written on the card. 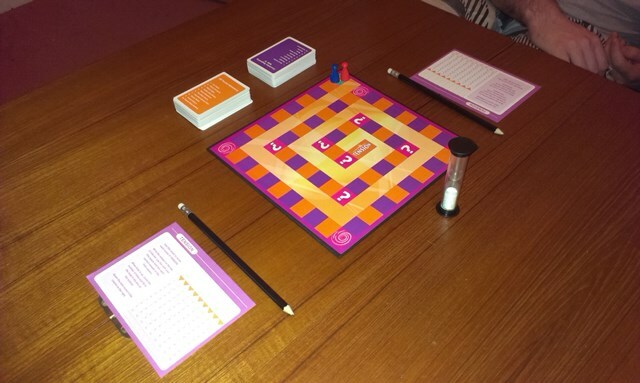 1 Orange and 1 Purple deck of Quiz cards. Objective: To be the first player/team to reach the ‘Tension’ marker in the middle of the board. Question mark squares – The player must guess how many answers they are going to get right before the title of the card is read. If they get at least that many right they may move the amount the guessed (and no more) forward, if they get less than what they guessed they have to move the amount they guessed backwards. The colour of the card they get for these squares is chosen by the other team. Whirlpool squares – If you land on one of these at the end of your move, the move you just made is immediately made again e.g. if you moved 7 and ended on a whirlpool you get to move 7 again straight away. 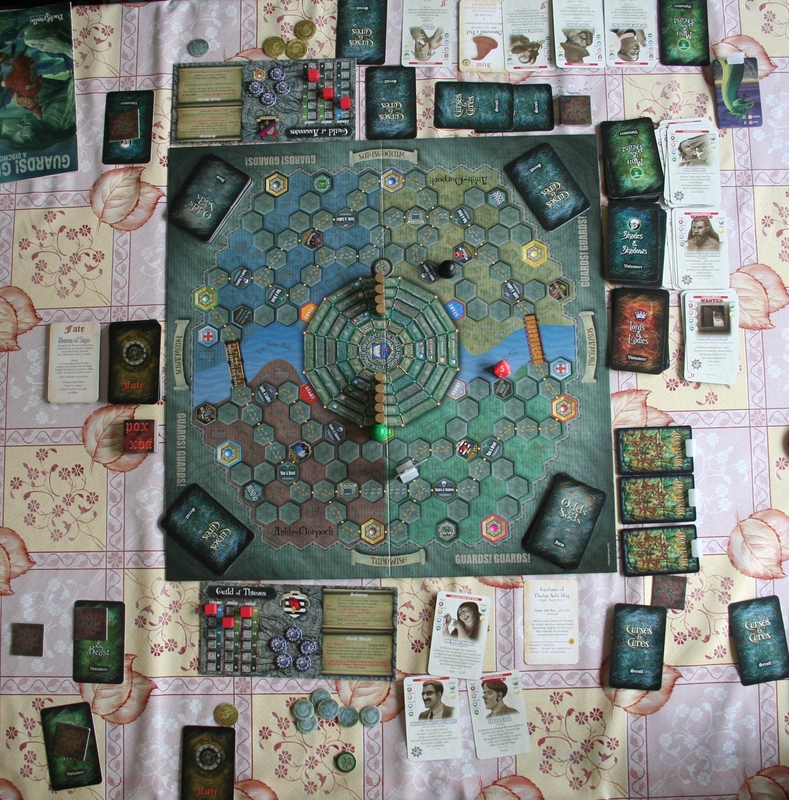 The player to reach the middle of the board first wins! BE REALLY SMART OR PICK THE SMART PERSON TO BE ON YOUR TEAM – Basically knowing a lot about a lot of things is helpful… As in all quiz games. TACTICALLY TRY TO HIT WHIRLPOOLS – If you can think fast enough you can try to hit Whirlpools intentionally. For example if you know you need eight to land on one, stop guessing once you know you’ve got eight right, because they you’ll move sixteen over all. TACTICALLY TRY TO MISS QUESTION MARKS – Try to miss question marks by making sure you get more or less than the amount needed to land on one. There is almost no history to be found on this game except that there are two editions of the game; the first one published in 1992 as Tension: The Crazy Naming Game and the second edition published more recently as Tension:The Zany Crazy Naming game, this is the edition we have which has more up to date topics/answers than the original. The one that can’t be read because of the flash is “Swiss Cheese”. Not only is the question so broad it literally has millions of answers but the 10 answers picked to be “the chosen few” are mostly ridiculous! If the questions where a little better devised and the general game design a little more complex it could be a very good game. Additionally I see no real reason why it needs to be only two players/teams, apart from the fact that the teams/players who aren’t guessing or reading are sitting around doing nothing… But that’s true of most board games ever… If it’s not your turn, you’re not doing anything. It does have the advantage that it’s easy to play, quite quick, and a good laugh, so it’s not all bad… It could just be so much better! But if you haven’t seen it, really don’t! Any film starring Rihanna is probably going to be terrible and Taylor Kitsch doesn’t have the best track record either (although I maintain John Carter was nowhere near as bad as people said it was). Anyway I have already digressed severely, so to the point! 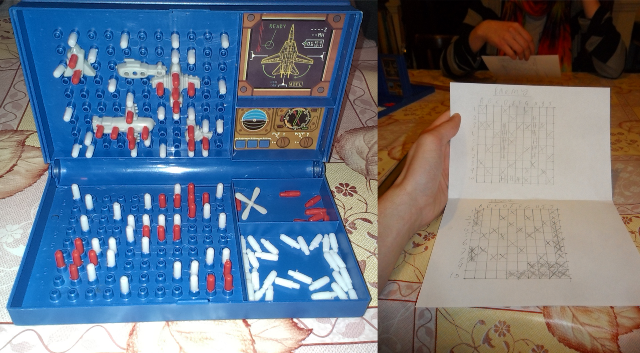 Two different ways to play battleships. Well we played this game the original way; which is on paper a bit like noughts and crosses (see the history section at the bottom for more info) and we played a newer version of the game that’s called Air Battle. So, for the paper one all you need is two pieces of paper, two pencils and a ruler/straight edge is handy, but not essential. 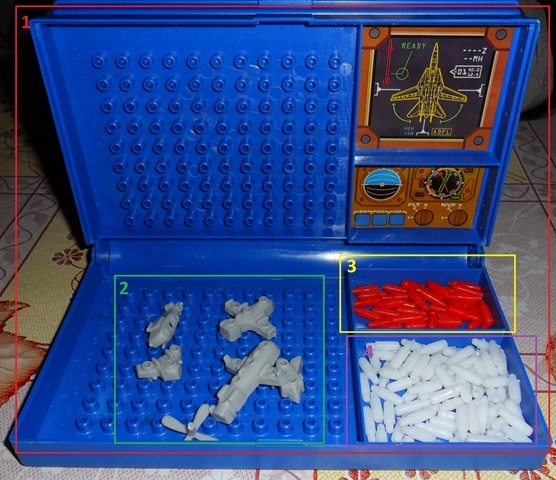 But for Air Battle and most other variations of Battleships you will find these pieces (or similar). A box with two sides each with a grid on the divider and a grid on the bottom. Five (amount may vary) battleships or similar craft. A load of white pegs for marking misses. 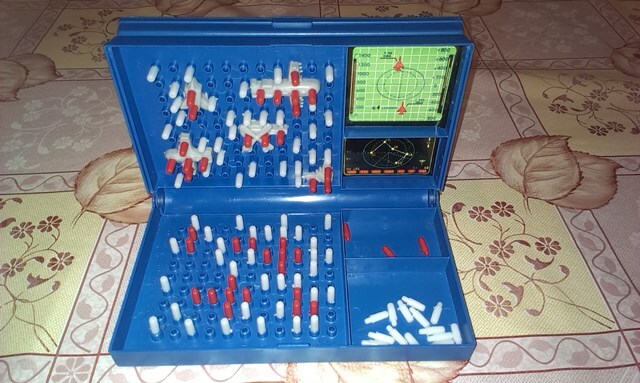 Objective: To sink all the other persons battleships by guessing correct grid co-ordinates until you’ve hit and sunk all their ships before they can do the same to you. 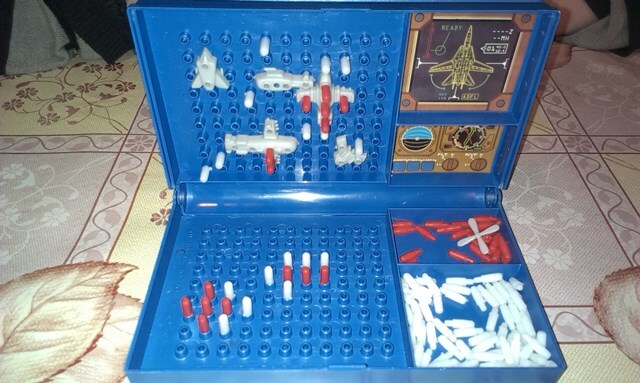 The game starts by by both player secretly placing their ships on there grid so only they can see. 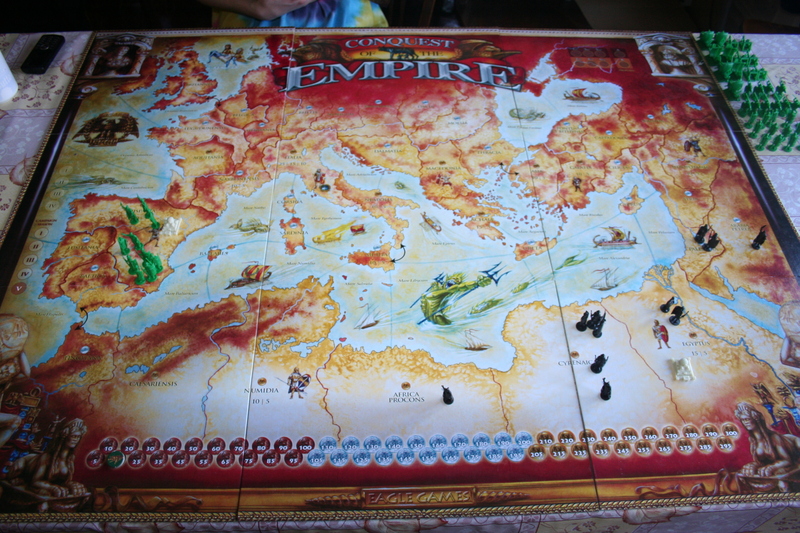 Each player then takes it in turns to guess the grid co-ordinates of the other persons ships; the other person must tell honestly if they have hit any of their ships. The player making the guess then records hits and misses on the grid that they have not placed their ships on so they can remember what they have and haven’t guessed. The other player also records where that player’s guessed if it’s a hit or a miss on the grid that they have placed there battleships on. The red pegs mark hits and white pegs mark misses. The top grid shows your battleships and the hits and misses your opponent has made and the bottom grid shows the hits and misses you have made. A player must announce when a ship is sunk and when all a players ships are sunk they’ve lost the game. TO CLUSTER OR NOT TO CLUSTER… That is the question. Sometimes it pays off to cluster all your ships together, because then when one ship is sunk your opponent thinks that’s it for that section of the board and goes to guessing some place else. However, once they catch on that this is what you’ve done they very soon defeat you. SEMI CLUSTER? – I find the best tactic is to put two of you ships together so it makes the shape of a one of the larger ships, that way at any point if you say sunk they think they’ve sunk a larger ship and stop bombing that area whilst really they’ve probably only sunk one of the two ships you put together. READ HER POKER FACE – As always it pays to know they way your opponent thinks. BE GOOD AT GAMES OF COMPLETE CHANCE – Because that’s really what this game comes down to. The original game was developed as a pen and paper game (which is why we played it on paper too) and was sold by multiple companies in the 1930s. It was released as a plastic board game by Milton Bradley in 1967. The game is thought to have originated from the French game L’Attaque. There is a Salvo variation to the rules that allows a player to call out 1 to 5 shots all at once to simulate the simultaneous discharge of guns. 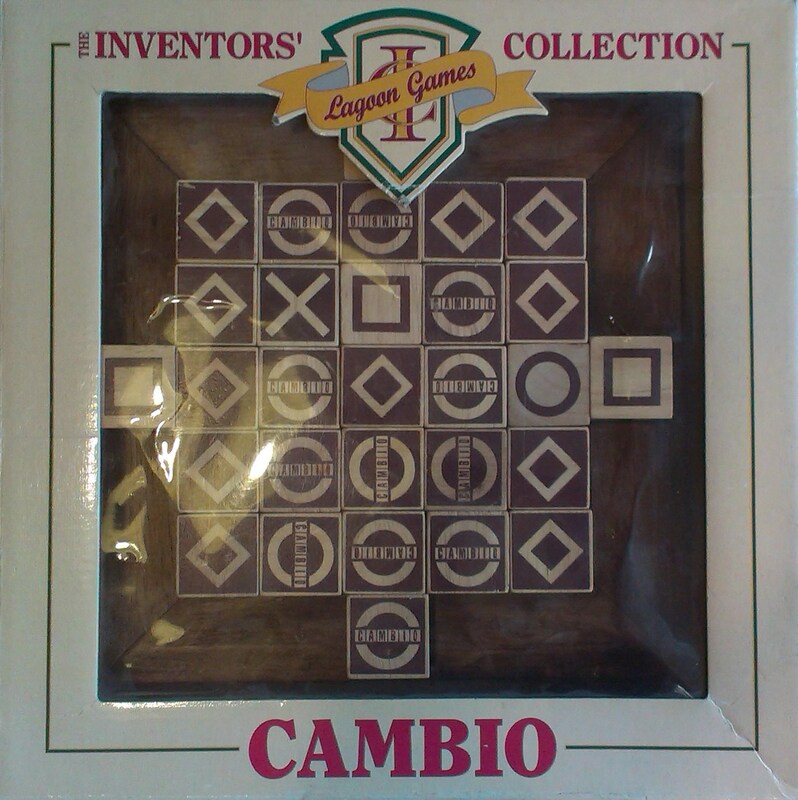 It was one of the earliest games to be produced as a computer game. A version of it was released on a Z80 Compucolor in 1979. That was then followed by Atari’s Battle Zone in the 1980s. 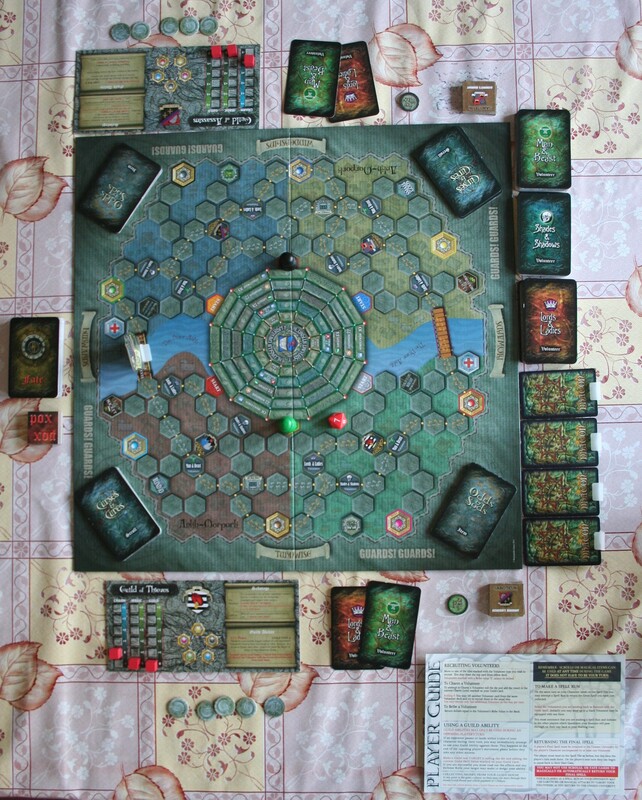 In 2010 an ‘updated’ version of the game was released which use hexagonal tiles and had islands on the board, also players could only place ships in their half of the board. Hasbro Family Game Night for the PlayStation 2 and Wii, as well as the Xbox 360 included Battleships. There are many, many variations of the game, including different sized grids versions, multiplayer versions, versions with submarines, versions with aircraft (like the one we played) and version with many different shaped craft. 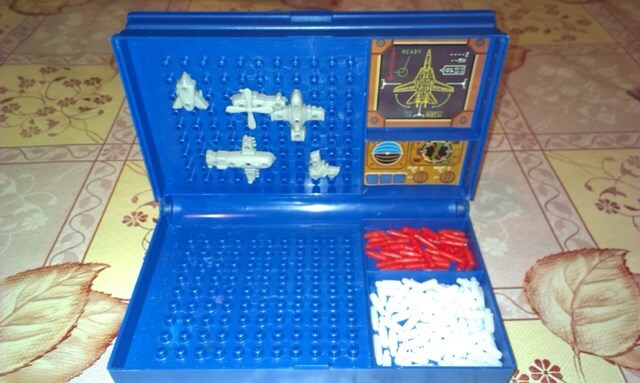 Obviously Battleships is iconic; its also good fun to play and takes next to no skill so anyone can do it. However it’s just a game of guessing, so gets easily boring and you can quite legitimately be beaten by a child at it… And that might tend to make you angry. 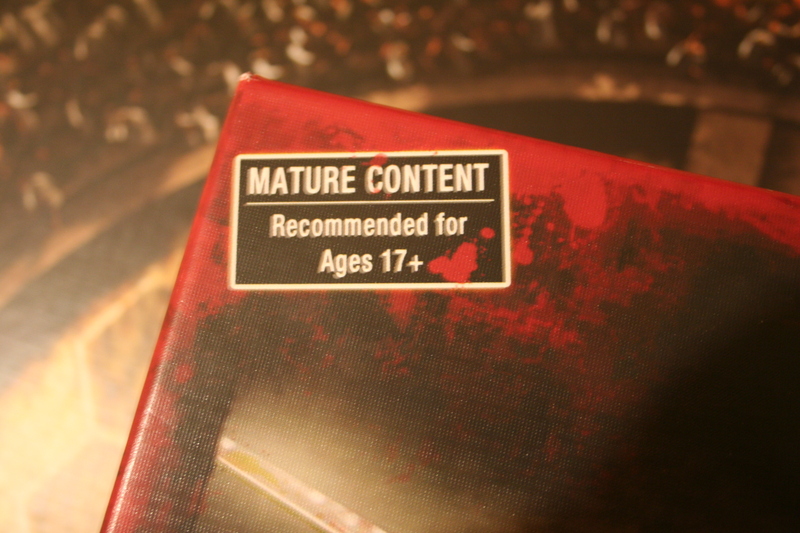 The age rating at the top corner of the box lid. This did make us laugh… A lot. Now unfortunately, being a big fan of the TV series this review is unlikely to be completely non- biased, I will however do my best to stay objective. 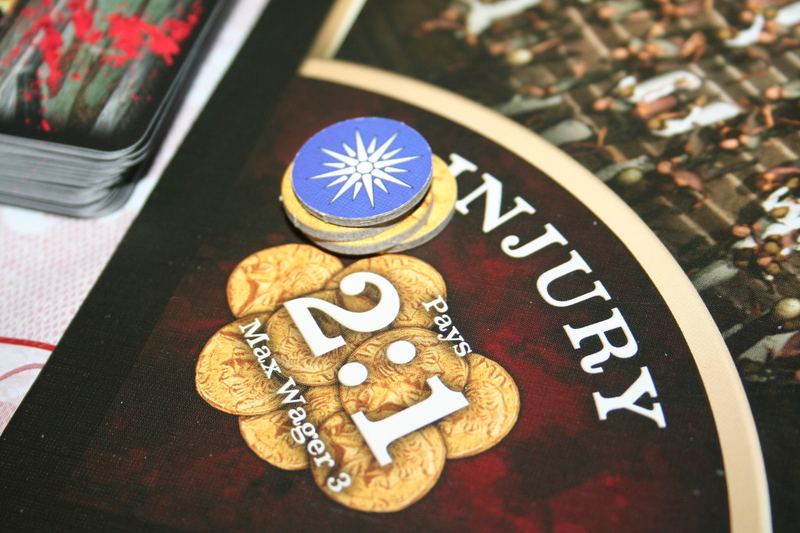 Objective: Be the first to raise your house influence to 12! Starting influence is set to 7 for a quick game and the starting amount of things dealt out. 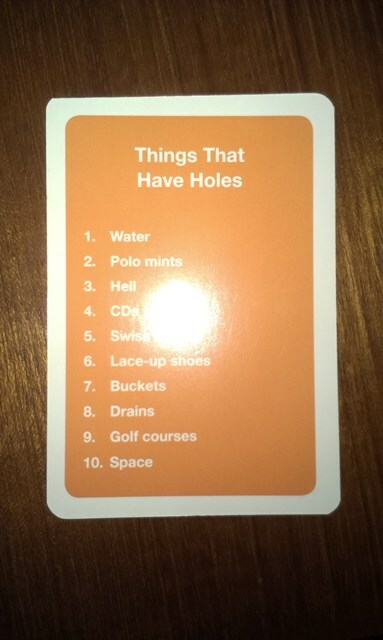 You then get dealt the starting number of items as dictated by your house card (circled green). So for Solonius that’s 2 Gladiators, 2 Slaves, 1 Guard and 12 Gold. 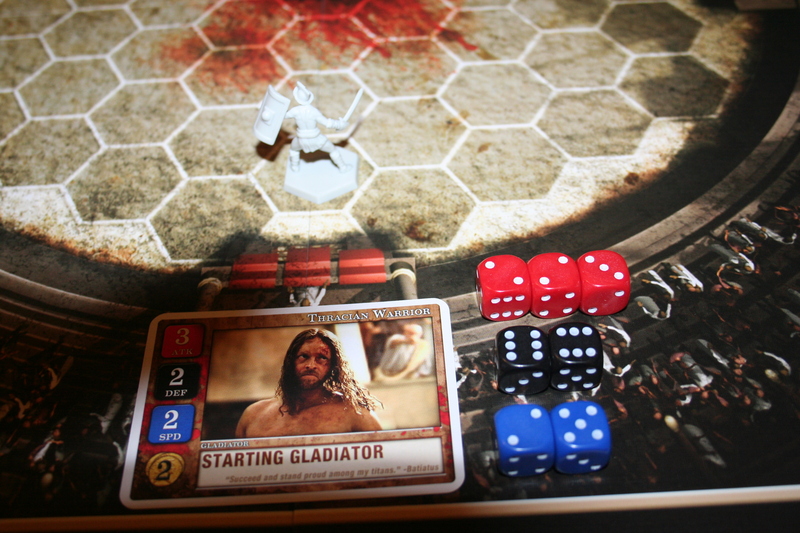 Additionally each player gets one gladiator figure, their 3 house betting tokens and a turn summary card. Refreshing Cards – Any cards that have been exhausted in the previous round (so are face down) get turn back up so their abilities can be used again. Healing Injuries – Attempt to heal any injured gladiators or slaves by performing a healing role – on a role of 4 – 6 they are healed anything less and they stay inured. Balancing the Ledgers – You gain one gold for every ready slave you have and you must pay one gold to the bank for every ready gladiator you have – if you cannot pay (or don’t want to) you must discard the card that’s making you pay. 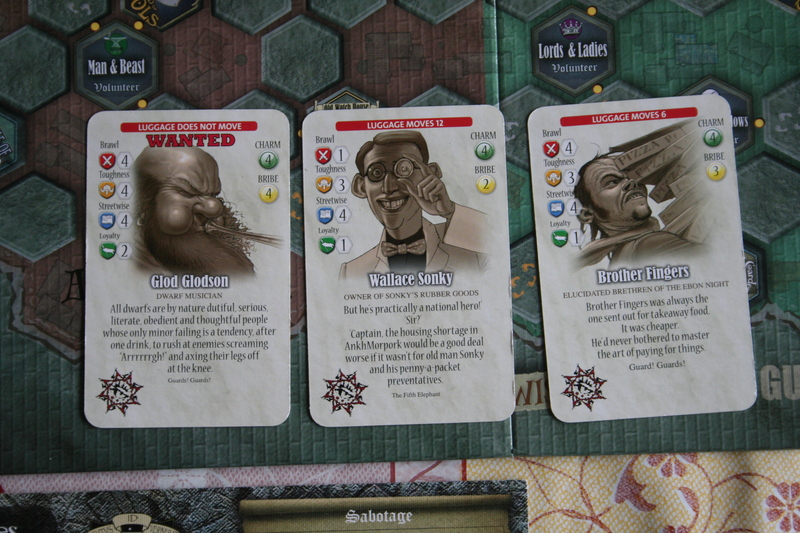 Drawing Cards – At the start of each intrigue phase each player draws three intrigue cards (players all receive three cards simultaneously). Playing Schemes/ Foiling Schemes/ Cashing in Cards – Some of the intrigue cards are schemes you can play against another Dominus (Latin word for master), cards that allow you to foil other schemes or get rid of an opponents guards. 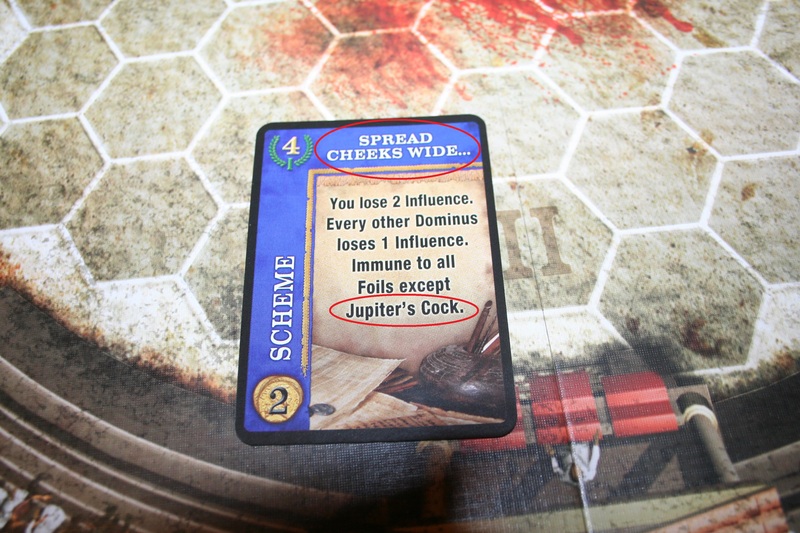 To play a Scheme you must have the right amount of influence to play it (as listed on the card), if you don’t you can pair with another Dominus to play it by adding your influence together but beware; deals that are made can be easily broken. If someone plays a scheme against you you can foil it by using your guards and performing a dice role or you can play a scheme foiling card that are reactions to schemes and also require that you have the right amount of influence to play it. Finally if you don’t want some of you cards or can’t keep them (as your had size is dictated by the amount of influence you have) you can cash in cards for the amount written on them from the bank. Open Market – At this point anything can be traded for anything for anything else. Except Intrigue cards, which cannot be sold. Auction – After open market is over each player conceals their gold in their hand and cards equal to the amount of players playing are drawn face down on to the board. The first card is flipped up; each player decides how much they want to bid for that card and hide it in their hand and hold it out over the board, then together they revel how much they have bid, highest bidder wins. Someone who bids nothing is ignored, but if everyone bids nothing the card is discarded. If there is a tie the two players who are tied place the amount they have already bid on the board and repeat the procedure until one player is victorious. This is then repeated with each card until all cards are sold or discarded. Bid for Hosting – This is done in the same way as the bidding for the cards. 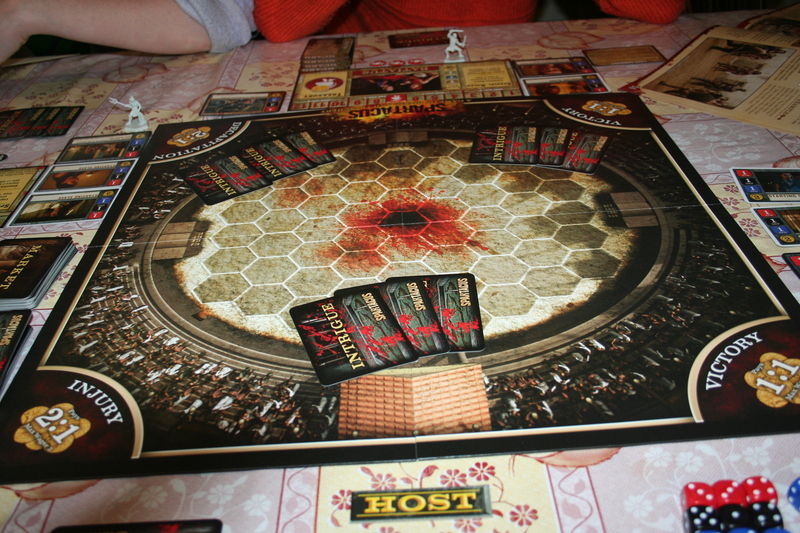 The person who wins the host bidding gets the Host token and it marks that they control the next phase of the game and choose who will fight who. Honour to the Host – The player that won the hosting rights in the auction gets +1 influence. Hosting the Event – The host then invites two players to take part in the games (they can invite themselves). If a player declines they lose one influence. If they accept they place their gladiator figure in the arena in the starting position then place the card of the gladiator they are fighting, along with any Weapons or Armour they are also using. A starting gladiator ready to battle. Tribute – The owners of the gladiators are then paid tribute if their gladiators have favour or are champions – +2 gold for each favour token and +6 gold if they are a champion. If they don’t have any favour and are not champions they get nothing. Place Wagers – It’s then time to place wagers, you can wager on who will win (competing players can’t wager against themselves) and how they will win (injury or decapitation). Three is the maximum wager on any one wager and the wagers you place are marked by putting you house wager tokens on top of your pile of gold on the wager you have made. So a bet on combatant one to win returns 1:1 odds so you can double your money. A bet on the fight ending in injury returns 2:1 odds so you triple your money. 3 Attack = 3 red dice, 2 Defence = 2 black dice and 2 Speed = 2 blue dice. Each player then roles their total amount of speed dice to determine who moves first, the player with the highest total wins and decides who moves first. Your total number of speed dice dictates how many spaces you can move; so if you have two dice you can move two spaces. You can chose to move and then attack or if you’re already adjacent to your enemy you can attack and then move away. Once adjacent you attack by rolling your attack dice while the defender roles their defence dice. You then line the dice up from highest to lowest, opposite each other. Any place where one attack dice is a higher number than the defence dice is a hit and any place where a defence dice is higher than the attack dice is successfully defended. If they’re equal it’s also a successful defence. Where attack die outnumber defence dice any additional roles that have no matching dice count as a hit so long as they are three or above. Two warriors ready for combat. The dice are your health; so for each hit that is obtained the taker of the hit decides which dice to get rid of, lowering their attack, defence or speed for the next move. All attributes must be reduced to 1 before any can be completely removed. If one is completely removed then the player has yielded, if two are reduced to zero in one attack the player is wounded and if all three are reduced to zero in one attack the player is decapitated. Victory and Defeat – The winning Dominus gains one influence. The winning gladiator revives one favour token, if it’s his third favour token he becomes a Champion. Wagers are then settled with the bank. If the loser was not decapitated the host of the games decides if he lives or dies with the thumbs up or down signal. To kill a loser who has favour will cost the hosting Dominus 1 influence per favour token and champions cannot be killed. After all this the turn phases are repeated unless one player has a full 12 influence at this point, then they’re the winner! If they have reached 12 influence before this point they are not yet the winner as they can still lose influence before the turn of play is over. MONEY IS POWER! Like in real life. If you are a broke Lanista (trainer of Gladiators) then you are a rather useless Lanista. UNDERSTAND WORTH! Linked to the first point, knowing what/how much to bid for something in this game is everything. Knowing what you need and what’s not worth buying (at that time) will be the key to winning and losing. HOST THE MOST! Bidding to be the host is always worth it, not only does it automatically give you influence you then have control too. KNOW YOUR FRIENDS! While this is a rather back stab-y game it’s important to know the people you’re playing with and understand when they’re likely to stick with you and at what point they will abandon you and leave you to be eaten by dogs. KEEP THINGS IN PERSPECTIVE! With such a large turn phase to the game it’s very easy to get caught up in just one round or one arena match and forget about the bigger picture and larger aim. Everything you do should be in aid of the bigger picture not just to get back at another player or just because you want to see a fight between two cool Gladiators. While the board game itself does not have much notable history (at least nothing I can find) the historical events it’s based (very loosely around) do so that’s more what this section is going to contain. 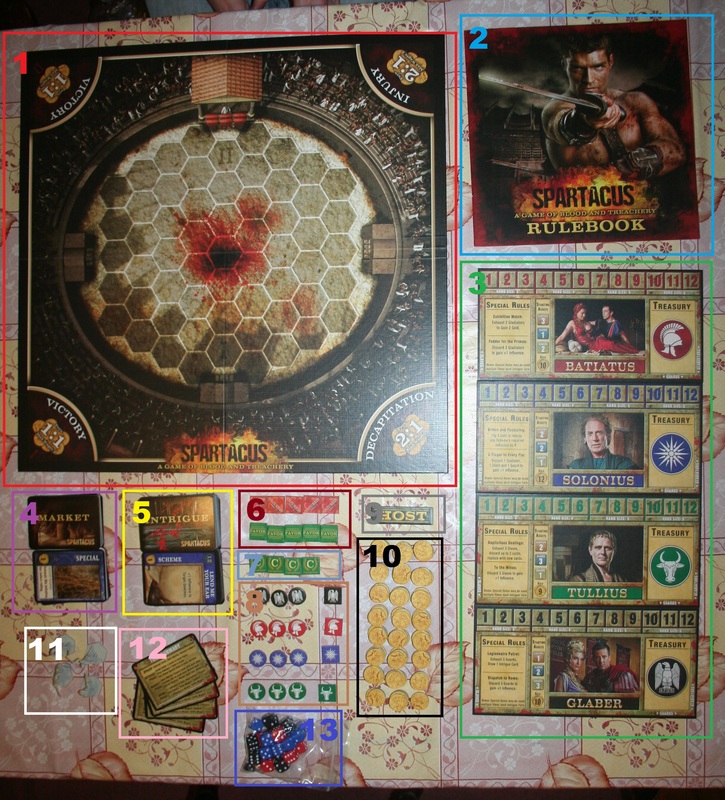 The board game was published in 2012, before the airing of the final season of the TV show, by A1 Games, Battlefront Miniatures Ltd, Gale Force Nine, LLC, Heidelberger Spieleverlag, Marabunta and Zvezda. 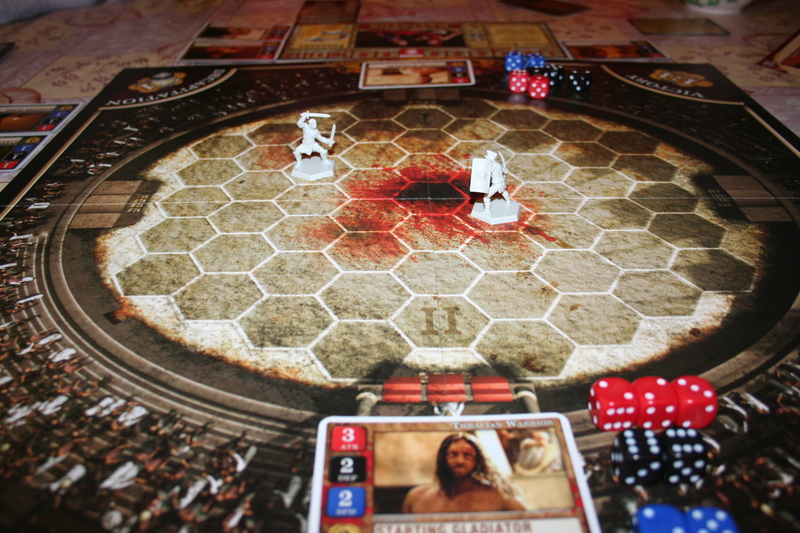 The board game is only based on the first season of the TV show Spartacus: Blood and Sand, it being the only season in which Spartacus is a Gladiator rather than a rebel. The TV series is a re-imagining of the 1960 film Spartacus directed by Stanley Kubrick and starring Kirk Douglas. However both the TV show and the film are based (loosely) around the historical Third Servile War of the Roman Republic. While historical facts on the war are highly debated it is often interpreted as a rebellion of oppressed people rising up against a slave owning oligarchy. 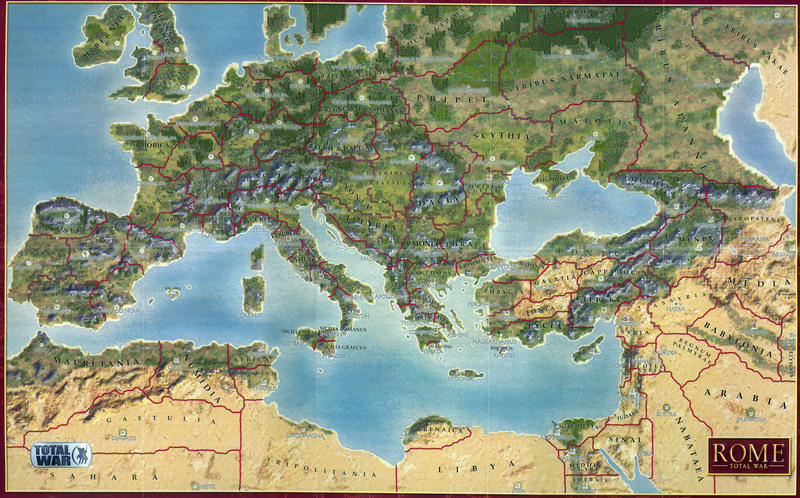 Historically Spartacus (the man) is supposed to have lived from 109 BC – 71 BC. The characters Crixus,Oenomaus, Castus and Gannicus, are also historically verified people who assisted in the uprising. He was born a Thracian and supposedly died on the Battlefield near to Petelia (modern-day Strongoli, Calabria, Italy) as depicted in the TV show and film (probably without the “I’m Spartacus” fiasco). This being Appian also that his body was never found. 6000 survivors of the battle where crucified alongside the Appian Way from Rome to Capua as depicted in the final episode of the TV show with the crucifixion of Gannicus. 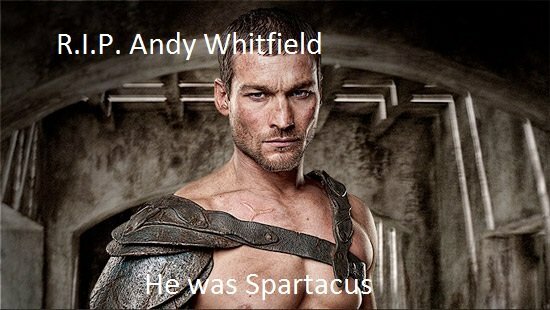 Andy Whitfield who played Spartacus in the first season Spartacus: Blood and Sand (who’s face should be on the front of the game box rather than his replacements Liam McIntyre) sadly died on September the 11 2011 of on-Hodgkin lymphoma and the series was literally less than half as good without him. Picture lovingly borrowed from: http://www.funnyjunk.com/funny_pictures/2600925/RIP. While my obvious like for the TV show has made this review at least slightly biased I would still maintain this game is a good game by anyone’s standards. It is, however perhaps a touch complex and drawn out. For example; cancelled down version of just the gladiator battles would have made quite a good game just in itself. So this game is primarily for the patient and those who are naturally enthusiastic about games not for those who think monopoly is the epitome of (board) gaming. I rate this box design 4.5/5! The only thing that would have made it better is a slot for the host marker to sit in. Yes I do think rate the box is going to have to become a permanent part of our posts. 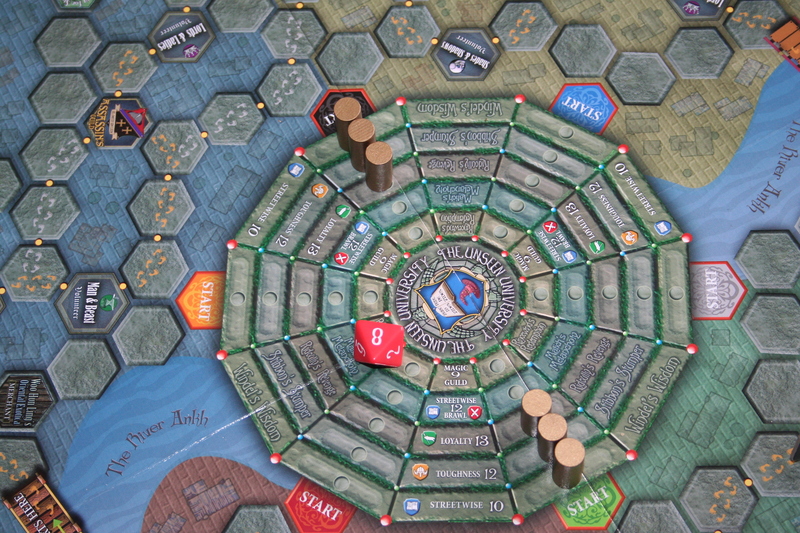 Now, there are two sets of rules to this game, as I explain in the History and Interesting Facts part of the post but this post is only covering the Classic rules, as we haven’t had the time to play the other rules. Hopefully there will be another post covering the other set of rules before the month is over, so keep an eye out for that. 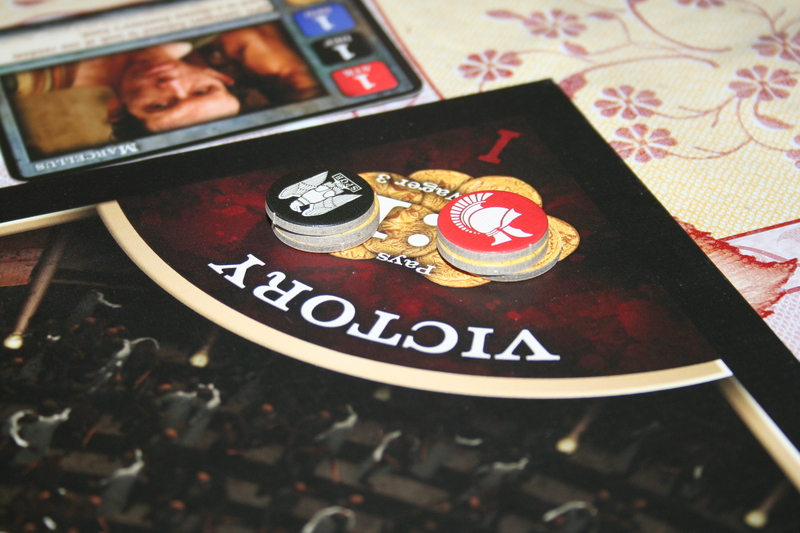 The aim of the game is ultimately just to capture the other player(s) Caesar, which can lead to a fairly short game if you get lucky and the other person is careless; or if the other person is careful it can be a long complex game of strategy and well thought-out battling. The board right at the beginning. 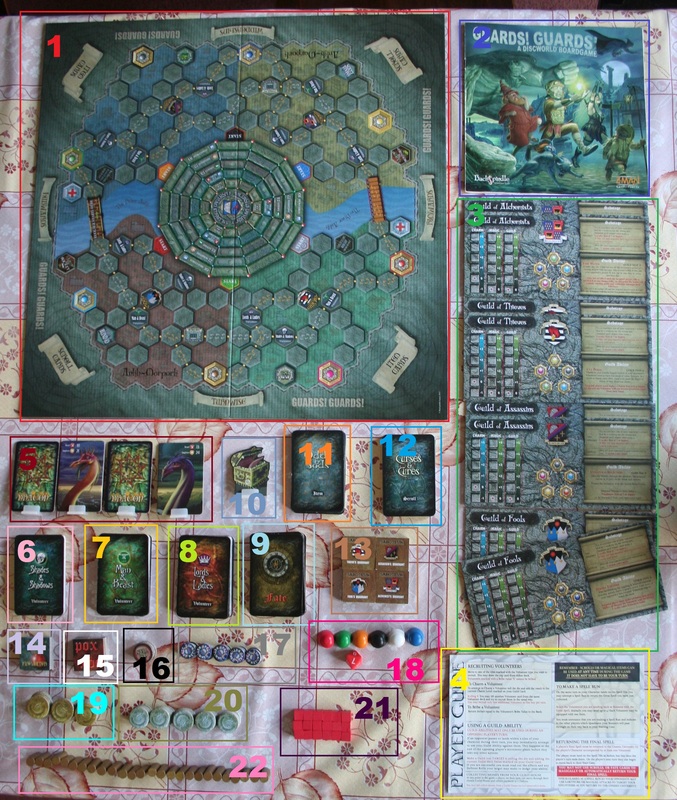 You start in one of the six starting provinces, these are shown on the board and the instruction book denotes which are available relative to how many players there are. The tribute scale at the bottom of the board is used to mark your income per-turn and increases if you capture provinces and decreases if you lose them depending on the worth of the province (marked on the board). you start on 15, as you home province is worth 10 but it also has a city in it which adds an additional 5. 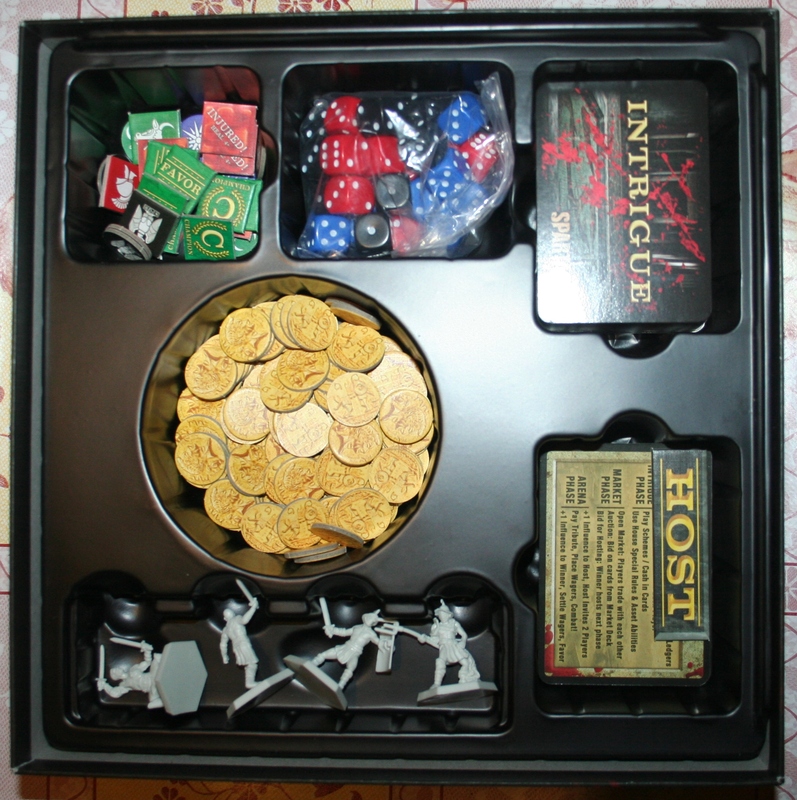 The tokens for each player show the amount of money they get each turn. So first up is movement, normal pieces can only move when attached to a General/Caesar. When they’re attached they form a legion; a legion may be up to 5 pieces (of any type) and then the General/Caesar to make a legion of six pieces overall. 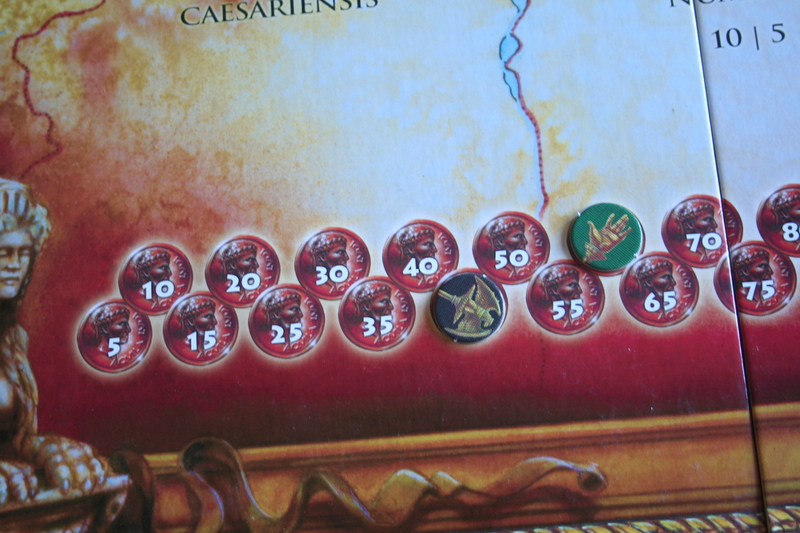 Without roads normal pieces may only move one space (being from one province to another) in a turn, however General/Caesar may move two, so they may move with a legion and then one further turn on their own. However they cannot fight by themselves – but are useful for conquering unoccupied provinces. The exception to this is roads; once on a road a player may move as far along that road as he/she likes. Galleys are the only units that can move without a General/Caesar, they can move up to two sea provinces even with no units in them. The first move of the game. The second part of a players turn is combat. 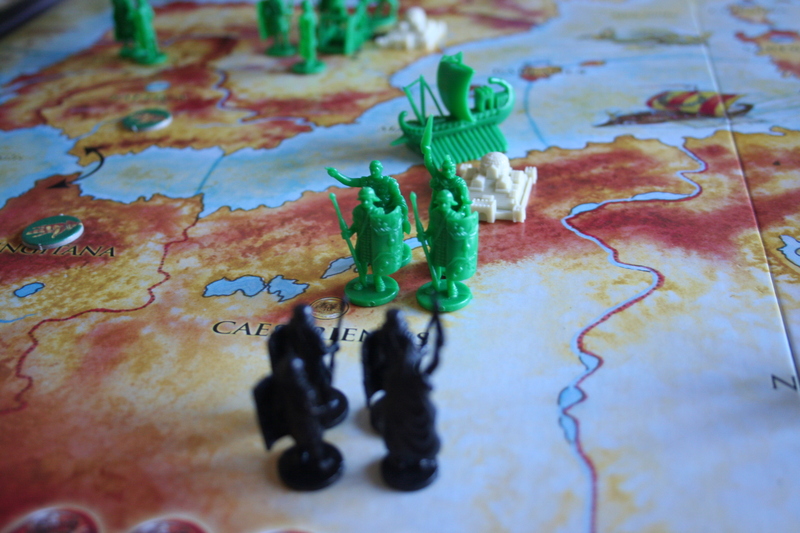 Combat occurs when you move your pieces into a province occupied by an enemy and once you have finished all of your moving. Combat is somewhat similar to Battle Cry! 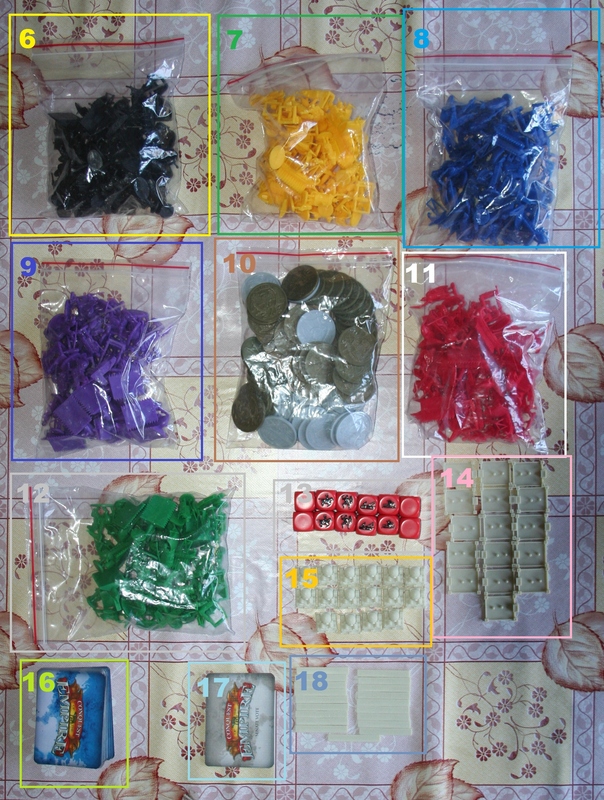 (as reviewed here) in that it uses dice with symbols that show which piece have to be removed. You role as many dice as there are piece in your legion (up to 6) and the defender does the same. 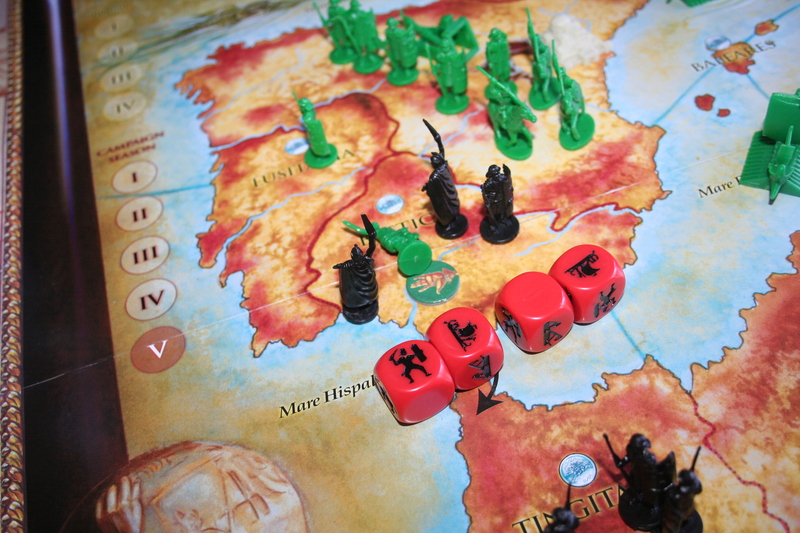 the relevant pieces are then removed according to the symbols on the dice, and either you fight again or one player retreats. Generals/Caesar are the last pieces to be removed from any legion and can only be captured when the rest of the legion has been destroyed. 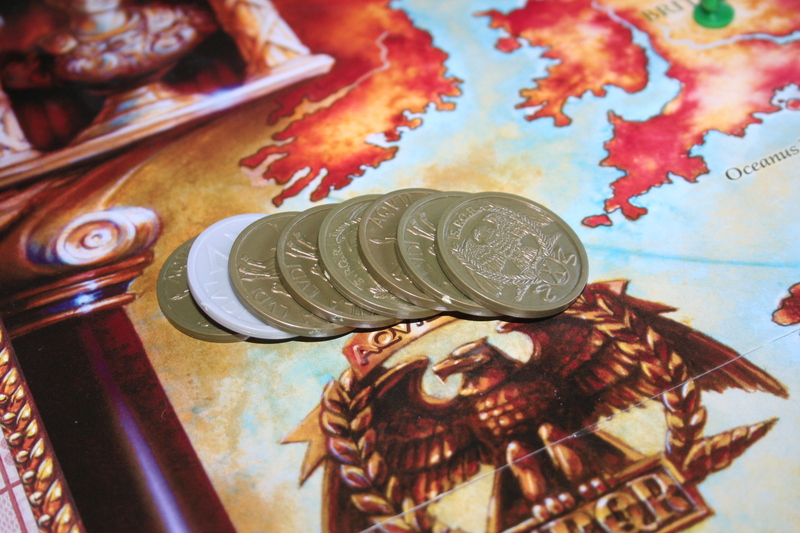 Captured Generals are kept by the winner and can be bartered with later in the move, if Caesar is captured the person who loses their Caesar has lost the game and is out. The next phase of a move is to collect tribute, that’s as simple as it sounds, you look at the tribute scale at the bottom of the board and collect the amount of tribute you are due. The next phase is to destroy cites, you can do this in provinces you own if they are about to be captured to stop the other player gaining any benefits from them. This phase doesn’t have to be done as you may not be in a situation where its required. However when inflation is trigger the first time (marked by the change in the tribute scale at the bottom of the board) cost doubles, when its triggered again (by the second change in the scale) the cost triples from the original prices. The very last phase of a players move is to places his newly brought pieces. All new combat units must be placed in the home province of the player buying them, ships are placed on the coast of that province, or on the closest coast if you are landlocked. Cities are placed in the relevant province that you want a city in, only one city per-province and only one fortification per-city. Roads can only be built between two cities in adjacent provinces but multiple road sections between multiple cities can be used to make one long road. This process is then repeated until there is only one players Caesar remaining. MONEY IS POWER! Conquering provinces is important to generate more tribute so you can buy more units so you can have more power. DON’T FORGET ABOUT SHIPS! Ships look like they can be a very useful tool to attack your enemy where he/she is not expecting. DON’T FORGET YOU CAN DESTROY YOUR OWN CITIES! Also destroying a city will destroy a road that runs between it and another city as roads can only exist between two cities. This could help slow a fast enemy advance. BRUTE FORCE IS KING! Due to the luck/probability of the dice actually being 100% tactical is difficult, so just out manning the other player in all conflicts is advised. 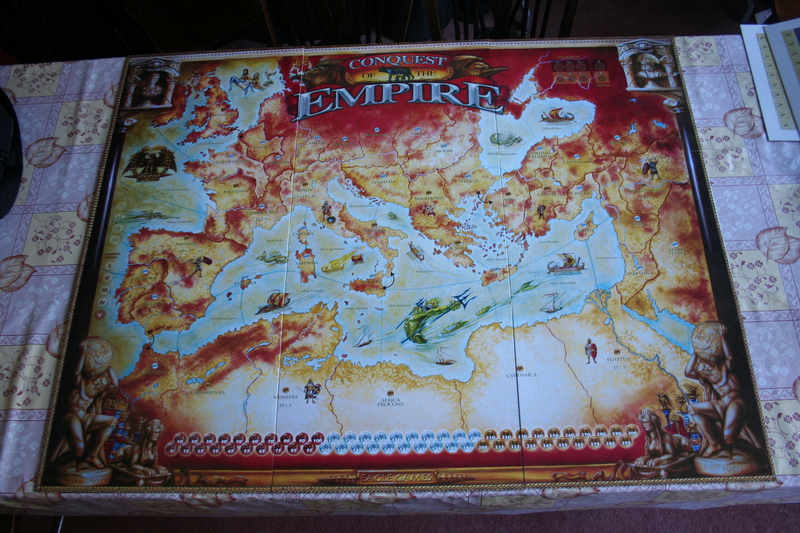 While I have stated the publication date of the game as 2005, and hyper linked the 2005 game on BoardGameGeek, the original version of the game was released in 1984 by Milton Bradley and it’s sole designer was Larry Harris, Jr. 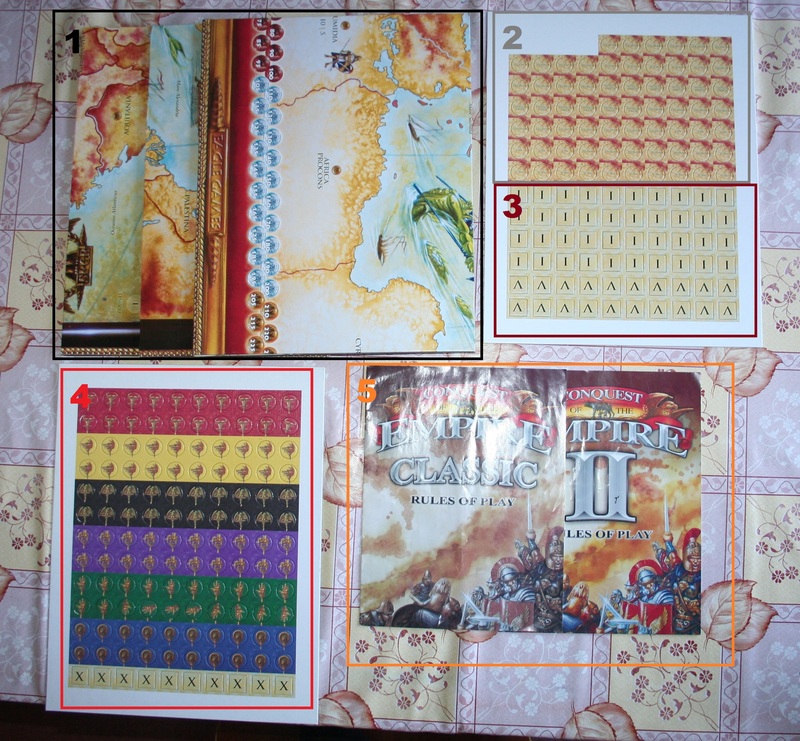 However the original version of the game’s catapult rules were considered to be “broken” so the 2005 version of the game was issued with two sets of rules, one that was similar to the original rules but with fixed catapult rules (the classic rules, the ones played in this article) and another completely new set that were based on Martin Wallace’s Struggle of Empires (these are Conquest of the Empire II rules). 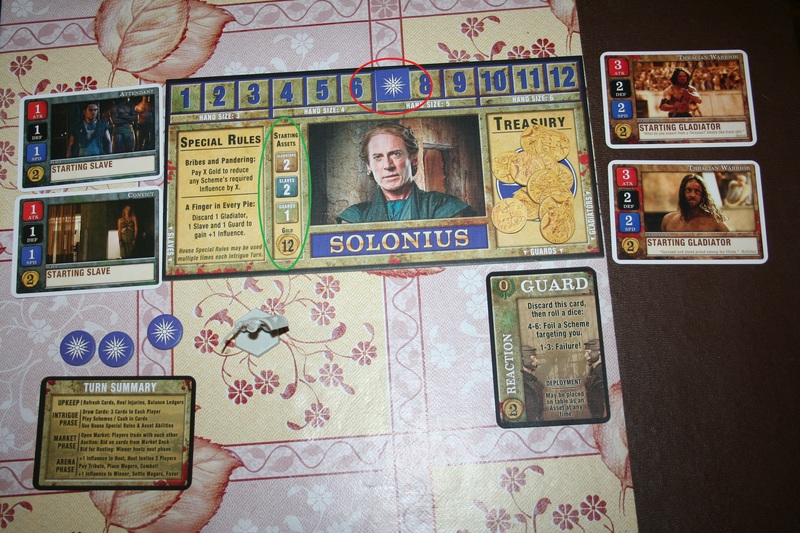 The original version of the game also had different combat rules and the rules in the 2005 version were changed along with the dice that have images that correspond to the different units. The game is thought to be very similar to the game Axis & Allies, this may be because it’s also designed by Larry Harris, Jr. (and because of this Axis & Allies is obviously going on our Games We Want page). The original version of the game is now completely out of print and therefore a prized collectors piece. However, that’s what Wikipedia says but you can buy a 1984 original copy from America for around £55 on Ebay here (eBay listing was active at time of publication). (This may be from the film Gladiator and therefore may not be historically accurate). Like I said in my introduction, the game really is a physical version of Rome: Total War, just less complex and in some ways more fun. 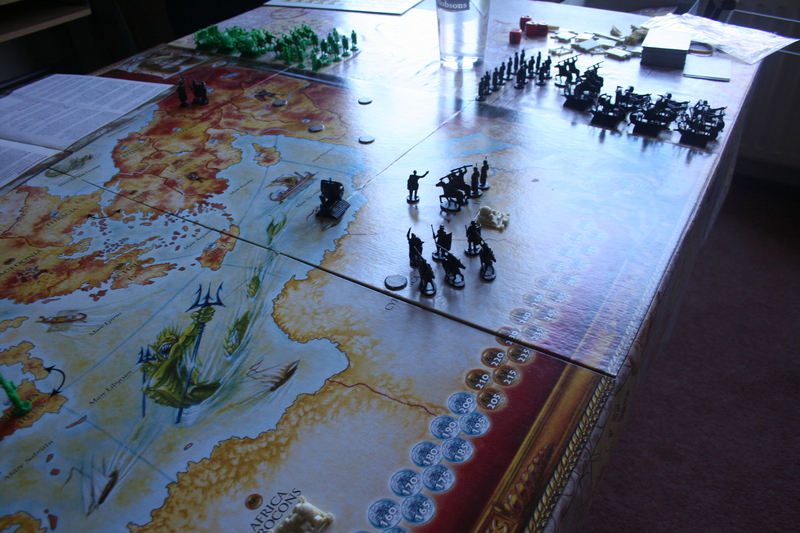 It is also the largest game we have played to date, which makes it just a little bit more awesome. 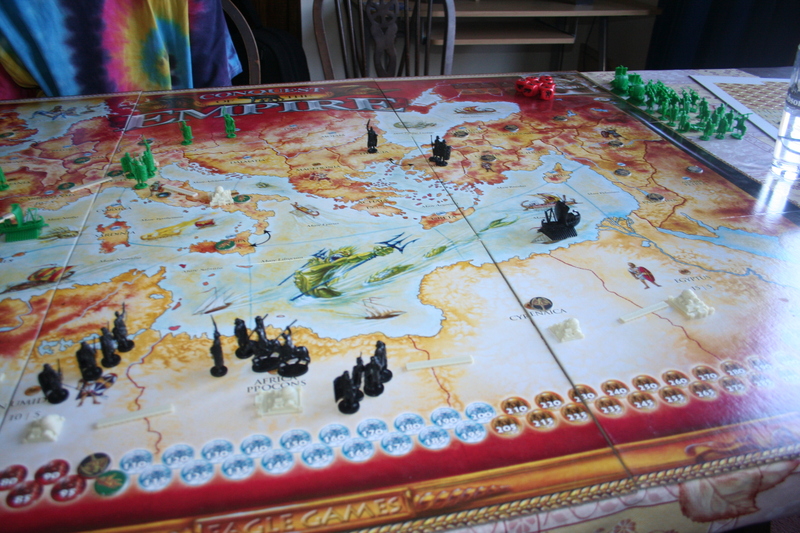 I like this game, I like it a lot, but I was always going to – as I said in my introduction, it’s just table top RTW. However this version of the rules has quite a lot of ambiguity but with careful reading and a bit of logic you can think your way through this. There are a few thing I think should be done differently, for example you should be able to build units in places other than your home provinces, other cities would have had barracks and been able to train men etc. Also it just feels wrong to collect your money half way through your turn, everyone knows turns begin with collecting money, it’s true of so many games, both table top and computerized. However I understand the building units one turn and not being able to move the till the next because it represents a training time. Everything thrown in the box! POOR BOX DESIGN! Now you may say that this is irrelevant to the game in the sense that it doesn’t affect game play. 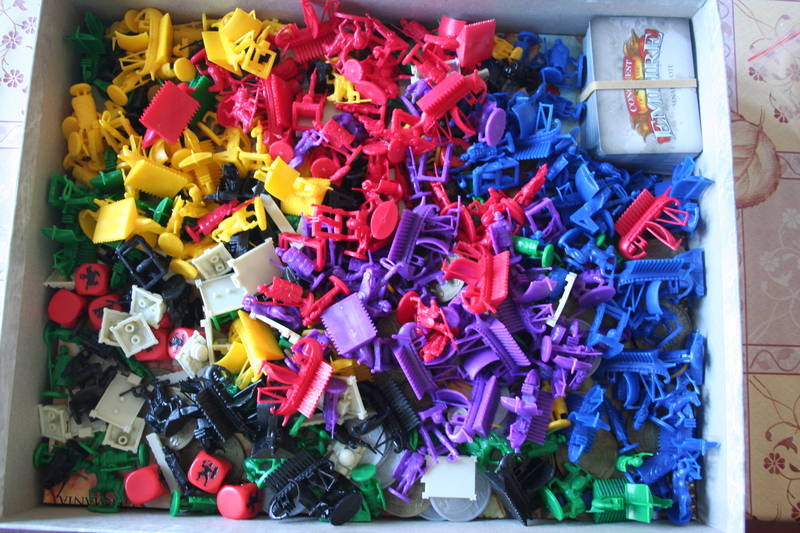 But it does, if you’ve had to spend 20 minutes sorting out pieces because there in a mixed mess you’re not going to have the same amount of fun playing the game as if they were all sorted already in a vacuum-formed tray in the box like 90% of games I’ve played (like Battle Cry!.) The only other game I’ve come across to rival this is the Pirate of the Caribbean edition of Buccaneer! Which you can read my rant about at the end of the post on it here. We’ll have to wait and see if the other way of playing it is as good or perhaps better. P.S. I (Miriam) wouldn’t usually add on to a post like this, but it was more like 2 hours sorting time than 20 minutes which makes this, in my opinion, an epic design flaw… Especially when trying to determine if all the pieces were still there. “Noble dragons don’t have friends. The nearest they can get to the idea is an enemy who is still alive.” – Guards! Guards! Guards! Guards! is a board game based on the book of the same name from the genius mind of Terry Pratchett (if you are unaware of Terry Pratchett read our update post for this month here). This is by far the game with the most individual pieces we’ve played so far. Objective: To return five of the eight Great Spells marked on your Guild card to the Unseen University before anyone else. Now, this game is very complicated and also not very all at the same time. It has a LOT of rules, and took us a good hour to read through them all, but once you get the hang of it it’s actually all quite simple and is effectively just a slightly complicated race. So because of the complexity of the rules I will only outline in rough what happens. 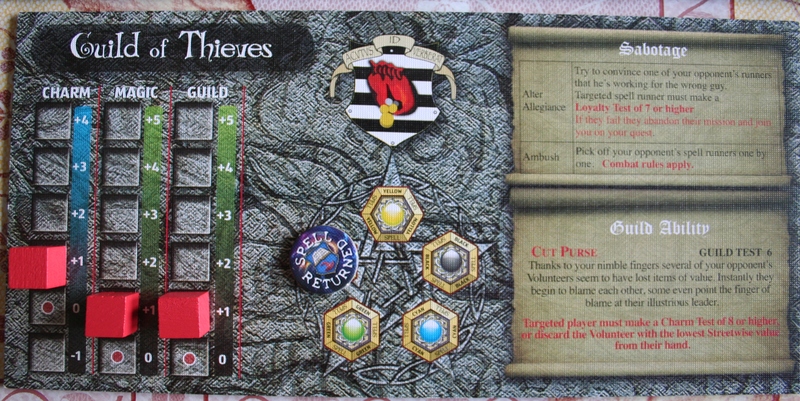 Each player starts at their start marker in the relevant guild quadrant, the board is divided into for quadrants, Assassins, Thieves, Fools and Alchemists quadrants. You start the game by picking a guild, for which you get a guild card for which has stats on it for Charm, Magic and Guild. You can increase these stats throughout the game by various methods and you blocks go up as shown bellow. Not that all of my stats (marked by the red blocks) have increased by one. Your stats are mostly increased by the recruitment of volunteers which is done by charming or bribing. 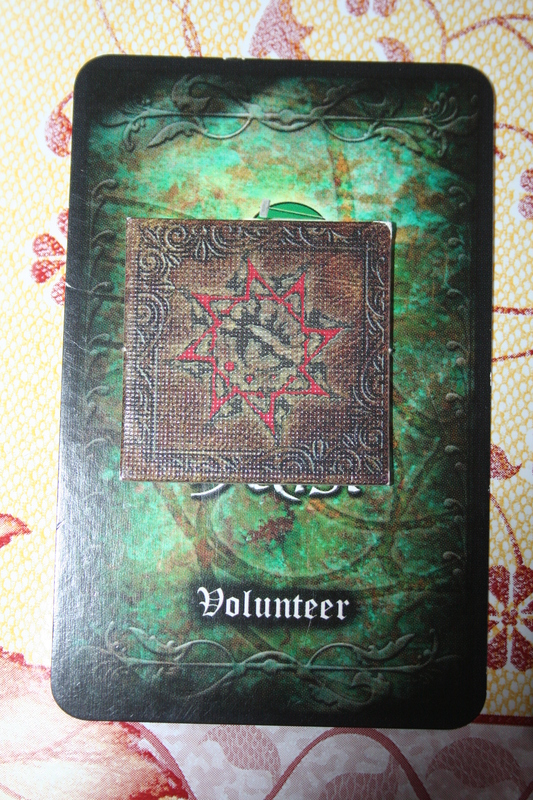 To bribe a volunteer you simply pay the amount marked in the bribe section on the card, to charm it you must roll the dice and achieve a number higher than its charm value, for this you also add you charm value from your stats to that number. A selection of volunteer cards. At this point we had both completed three levels of the wizards challenge and therefore returned 3 spells each. These spell runs can be sabotaged and you can use your volunteers to fight with each other, there are also items and scrolls that can be very helpful but I won’t go into these as, again, we would be here forever. The symbols in the bottom left mark them as members of the Brotherhood. A summoned dragon in play. The dragon mechanics are complicated and in many respects kind of irrelevant, as once the dragon is summon and the threat initially met it’s very easy to just ignore it and carry on with the game regardless. However, one fun aspect is that if all four dragons come into play the game ends and nobody wins, this is a bit of a reoccurring theme in Terry Pratchett’s game as there is a similar mechanic in the Ankh-Morpork (read our post on it here) game as well as The Witches. Although this can have the downside of being rather anti-climactic and making you feel like you just wasted a few hours. The game finished… And won by me! There are plenty of other rules about playing the game and other things and if you want you can read the revised rules here. We were following the unrevised rules, having an original edition of the game, so there was some ambiguity at points as to whether you actually could sabotage like that, amongst other things, but we worked through it. Having only played this game twice I have a limited idea of the best strategy. But one thing I did notice was that the person who collects as many volunteers as possible rather than going straight for the spells seems to have an advantage. Also NEVER forget about the scrolls and items as they can get you out of some tight binds, the first time we played I basically ignored them, to my own peril. Also PLACE SABOTEURS! It is the difference between winning and losing, if you can sabotage the other persons spell run you have the edge! A saboteur ready to pounce. 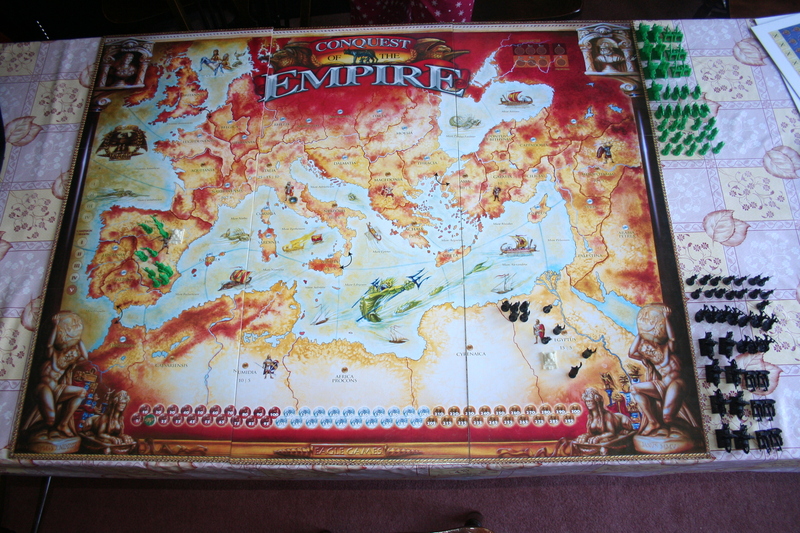 Although the board game was published in 2011 it was originally conceived in 1991. Leonard Boyd Originally conceived the idea and played it with friends until in 1995 he showed it to Terry Pratchett. Terry Pratchett liked the game but said they needed the backing of a major games company to make it all happen. In 1999 Colin Smythe (currently Terry Pratchett’s agent) suggest that the game never be published…I’m quite happy that he was wrong and they didn’t give up on it. 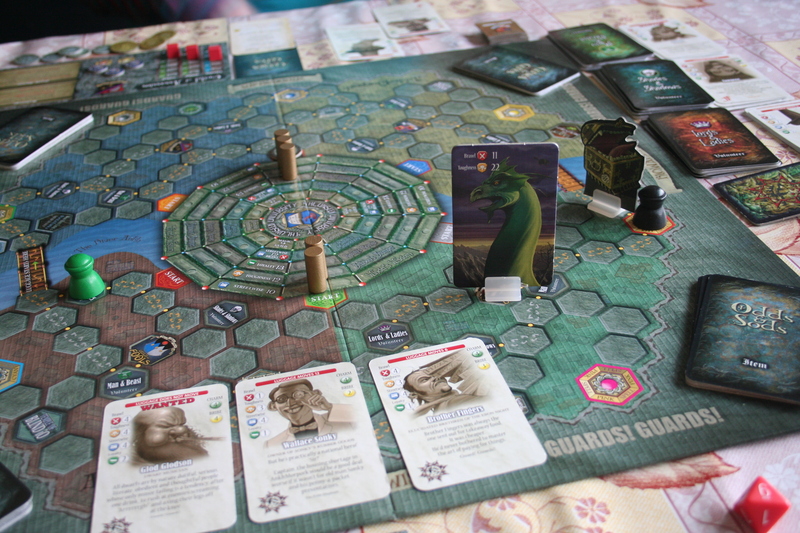 In 2006 Gary Wyatt (of the Green Games Company) advised that they tried again with the publication of it as the board games market had picked up significantly since 1995. So in Junes 2008 it was taken to the Speil Toy fair in Essen, Germany where it was shown to many companies, a couple of companies requested copies for play testing. In 2008 Wolfgang Ludtke of TM-Spiele/Kosmos Games in Germany asked about developing a game based on the books of Terry Pratchett so they go sent a prototype too. All three companies that had play tested the game felt that it needed a redesign to be aimed more at the hobby market. 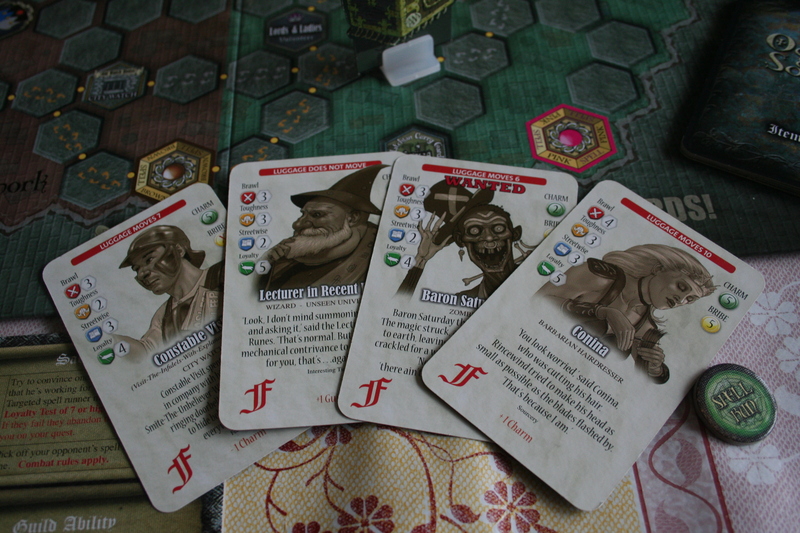 So after FIVE redesigns it was sent for testing by the same three companies, it was also test played by Terry Pratchett fans, it got the backing of Z-Man Games and a license from Terry Pratchett. The game was finally published in September of 2011! Showing that the road to getting a board game published can be long and very hard but if you end up with a great game its worth it in the end. Also while Thud is the oldest of the Terry Pratchett board games by publication date this one is probably the oldest in concept. To read the full history of the game go to the official website here.